The 2015 National is officially over. With luck, everyone that attended had a good time and secured some cardboard that made them happy. While mine, like other blogger's National experience was spent NOT at the National, I have still secured much cardboard that brings a smile to my face. For my last day at the stay at home National, we have three "vendors" worth of cards to show off. First off is AJ from The Lost Collector. A nice out of the blue PWE arrived from AJ, loaded with White Sox. Lots of great additions to a number of years in the Sox box. I have so few of the Heritage in the center. I was not doing much collecting at that time of the year. Nice shot of the Bull getting reading to destroy a baseball. 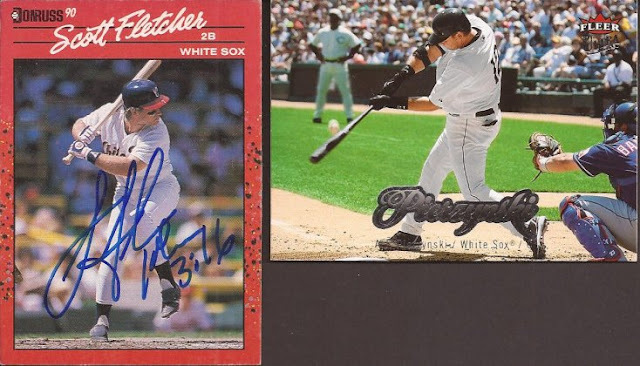 While that Pierzynski is a dupe for the throwback binder, it's a great photo and an underused uniform. AJ also gave me permission to sell the Fletcher auto and retire to Boca, so later losers - I AM OUTTA HERE! Thanks for the mail, AJ. Jim from the recently deactivated GCRL (he warned me he would do it and sure enough he did) has been dropping PWEs on me for the past couple weeks. His latest hit a bunch of custom collections. My thought is we keep bombarding him with cards so he has to keep writing. At least that's my plan. A new bunting card, on for the throwback, and the final for the DP binder. My thought is that Jim expected the Bodick on the right to make it into the throwback binder as well, since the reverse has a sweet uniform. However, that card is already obtained, so I just added a 2nd and put it with the other double plays. That Sale is m first A&G for 2015, though I recently picked up my first rack pack - a relic of a local chef. My wife and I now have a bet on whether he will return it with a TTM as she is a huge fan of his and me, I'm not much into Food Network. The Shark goes into the Sox box and the SC Fisk is set filler. Thanks, Jim. Start a new blog, would ya! Final vendor from the SAH National was one called ebay. Yup, I had a big pickup off of the bay of E. In fact, it's one of my most wanted. 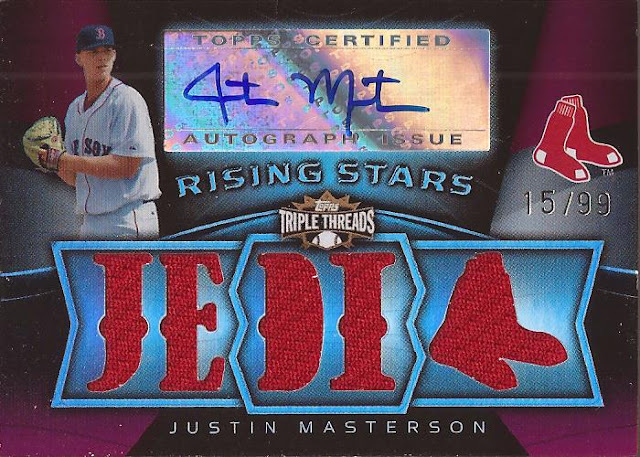 I have missed out twice on one of these cards, and all searches would return one up on the site with an insane buy it now of $50. Finally secured this beaut for under 10 bucks shipped. Gotta have the Jedi card for my collection, and now I do. Thank you...er..... ebay....? So the SAH National is over. With luck, next year is a real National trip. If not, we'll be at this again. Congrats on the Jedi white whale. I love that OK Go video. Nice selection. Echoing Tom sentiments, excellent choice. Also, just got done watching the Empire Strikes Back, so the Jedi card was apt timing! Nice Jedi snag... I try to look once in awhile , only to see the same $50 card...Glad you got one..
Hope you still send some PWEs from Boca.